This is the 14th studio album from Malcolm Holcombe and it’s clear after one listen to his gravelly baritone voice that he has served his time out on the highway of life. Last year he put out a gripping retrospective, ’The RCA Sessions’, with dramatic re-recordings of some of his better known songs alongside a group of brilliant musicians that reminded us all what a unique talent he remains. This new album was produced by Grammy-winning producer and engineer Ray Kennedy and Brian Brinkerhoff. ’Another Black Hole’ features Holcombe’s trademark rasping vocals and bright, percussive guitar accentuating his insightful lyrics. It was recorded at Room & Board Studios in Nashville, and the 10-song set features longtime musical compatriots including Jared Tyler (dobro, baritone guitar, banjo, mandolin and harmony vocals), Dave Roe (upright and electric bass), Ken Coomer (drums and percussion), Tony Joe White (electric guitar), Future Man (percussion) and Drea Merritt (vocal harmony). The album kicks off in fine style with ‘Sweet Georgia’ with Malcolm’s unique voice to the fore and the musicians kicking up a quiet storm behind him with a strutting banjo and a string bass that powers things along and a dobro cutting through. It has a wonderful relaxed groove that never out stays its welcome, in short its a perfect opener with a terrific summery vibe. That’s quickly followed by the slower paced title track ‘Another Black Hole’ that has the impressive slide guitar of Tony Joe White threading a dangerous path through it (Mr White wrote ‘Polk Salad Annie’ covered by Elvis Presley fact fans). It sounds menacing and spooky with the female vocal providing a distant banshee wail that rolls through the chorus making it an early highlight. The musicians here are wonderful and the sound is clear and true.’To Get By’ is a song about struggling through the mundanities of life on a shoe string and gets my vote for simply mentioning a ‘fridgidaire’ and using the phrase “high falutin'”. The guitar chimes and there’s a prominent mandolin sprucing things up alongside, as ever, Malcolm’s croaking weather beaten voice. The course for the album is pretty much set by this third tune but it’s all high class stuff and if you like your country with a touch of the rough edges of Kris Kristofferson’s cowboy outlaw material then you’ll find much to enjoy here. Holcombe has a keen ear to twist the odd phrase that gives it an edge you don’t hear that often. It’s never overdone and the band are constantly superb, possessing some of the oddness that Tom Waits’ musicians add to his records though, perhaps, in a slightly more mainstream way. ‘Papermill Man’ rocks along nicely and again features Tony Joe White on scintillating steamy slide guitar. It also features the visionary percussionist Futureman, also known as Roy Wooten, inventor of the drumitar, who lends percussion on this and several other cuts. Drea Merritt drops by to sing sweet harmonies across the album as well. In ‘Leavin’ Anna’ Holcombe croons “A working man’s a working man/ Makes the flowers grow.” The labourers, the displaced, the papermill worker, the man who spends “nickels and dimes like hundred dollar bills,” these are Malcolm Holcombe’s people and the ones who live in his songs. Perhaps what makes this album stand out is the sheer quality of the songs and the quality musicians alongside Holcombe’s lived-in voice that drips with world weary melancholia as he looks back over shattered lives and old memories, but it makes a potent stew that’s well worth getting a taste for and, if you are a novice, there’s a veritable feast of a back catalogue to sample after this. Go and eat at his table! Holcombe is one of those names that I look out for and he never fails to deliver. This is his 14th album and every time I go through it I come away with a little more appreciation of his songwriting and guitar playing, all buried under that voice, rasping and breathy and sounding as though he had smoked a million cigarettes – this week. He is a storyteller and all of the 10 tracks give you a picture of another piece of North Carolina life, not easy and never as simple as you first imagine and I must admit that you begin to get the mood of the song before understanding the theme but I also found myself wanting to get deeper into his music as the album went on. All of the 10 songs here were written by Holcombe but he is aided by some stellar musicians in Jared Tyler (guitar, mandolin, banjo, dobro), David Roe (bass) & Ken Coomer (drums) while Tony Joe White plays on a number of the tracks, Ray Wooten adds percussion and Drea Merritt sings harmonies on a few. White’s guitar on ‘Papermill Man’ is stunning. The songs all talk to the hardships of life but they also show that there is redemption to be found in 40 years hard work. He sings about labourers, men who work on the paper mills, men who are displaced by the march of technology or mortgages and his music backs up the tales in his lyrics. I would say that there are only a few in the roots/Americana field that I would grab as soon as they are available but Malcolm Holcombe is one of the very best. If he is only ever remembered for one song then it should be ‘September’ which is so dark and eerie that it is impossible to listen to only once – in my opinion it should be up there as one of the songs of the year. Recorded at Room & Board Studios in Nashville, TN, the 10-song set features longtime musical compatriots including Jared Tyler (dobro, baritone guitar, banjo, mandolin and harmony vocals), Dave Roe (upright and electric bass), Ken Coomer (drums and percussion), Tony Joe White (electric guitar), Future Man (percussion) and Drea Merritt (vocal harmony). Get Malcolm Holcombe tickets here. It is always a thrill to receive a new Malcolm Holcombe album, the intensity of the music, the relentless rhythm, amazing lyrics coupled with a voice that’s as sharp as barbed-wired soaked in whiskey and only let loose on weekends. Holcombe’s live shows have become legendary, sat with his acoustic guitar across his body, rocking back and forth with much energy and his head doing likewise. Intense hasn’t a look in when it comes to Malcolm Holcombe’s music. Here it is pretty much the same (though toned down in comparison), only he has taken the liberty of adding a little more pep to a couple of songs I would rather he didn’t. It isn’t I have anything against swamp fox Tony Joe White getting into the act, only he doesn’t need to be a bit of a rocker, his music is spicy enough. It only becomes a little cluttered to the detriment of his lyrics, and an acoustic base made up of his good friend Jared Tyler (Dobro, baritone guitar, banjo, mandolin, harmony vocals), Dave Roe (upright, electric bass), Ken Coomer (drums, percussion) plus Future Man (Roy Wooten), Drea Merritt (harmony vocals) percussion. Maybe he felt he needed to flex a few additional muscles on a couple of numbers. As for the songs, the album consists of ten self-penned compositions, and despite a reservation or two they are up to his usual high standard as he blends words of eclectic wisdom with everyday people’s happenings, and on coming down from a Holcombe high he comes up with such staggering pieces as “To Get By”, “Sweet Georgia” and to a lesser degree “Leavin’ Anna”; the easy rolling melodies greater than some things people have sacrificed their all. Others of note include slow paced sombre, evocative offering “Heidelberg Blues” and with the above keener rocking beat “Don’t Play Around” comes across good. But not to the degree of the above or “Someone Missing” as Malcolm sets off on one of his exciting (and exhilarating) journeys with the aid of multi-picker Tyler, to strike gold. “Papermill Man” has a rockin soul tinged sound run through it as in the company of White, Futureman and fine voiced Merritt he takes a trip, music wise into the hustle of the city. Be sure to watch out for tour dates in the UK during May. To borrow the words from a Neil Young album title, there's a ragged glory about the music of Malcolm Holcombe. The apparently shambolic sheen to Holcombe's recordings add sparkle to his stirring collection of albums, the latest of which is the magical, Another Black Hole. Here he stirringly serves up an alluring, unforced range of songs none of which lacks his distinctive, gruff tones pleasingly set against swampy rock or finely pitched acoustic backing, provided by ace mates in the studio. Some tracks come over all rusty and dusty and care worn, but with eloquent, hard-hitting messages, dark and raw. On the other hand, there is a natural, gentle touch, highlighted by the gorgeous, mellow and heartfelt Guy Clark-like, Way Behind, which warms the listener as it closes this ten-track beauty of an album. Adept, and minus any bluff or bluster, Holcombe is a master of carefully-crafted, delicate and fiery lyrics with an undercurrent that's deliciously matter of fact and caringly edgy via a spiky delivery. Having spent the last few months rarely separated from his triumphant The RCA Sessions album that came out in April 2015 - a retrospective of his two decades of recordings - it was a real deal pleasure to get my hand on Another Black Hole. Opener Sweet Georgia - bumps along with a mandolin lead on a blanket of goodness not far removed from McGuiness Flint while the title track has breathy lyrics with twanging guitar and mandolins shooting the breeze to allow Holcombe space to grunt and groan. And the way the man from North Carolina sings, it's as if he's never quite ready to let go of the final word in a line - delayed slurring is a technique he's perfected. John Prine springs to mind in To Get By while the intro to Don't Play Around sounds all John Mellencamp before Holcombe launches into his most menacing track of the album, complete with swear words. Brooding doesn't cover this delicious five-minute tirade: "California wanna bes and Midwest muscles / stick close to the ground / feedin' the famine in my backyard / non profit town." Papermill Man must be played at a volume that will annoy your neighbours: superb Creedence Clearwater rollin' and bouncin' with added TJW, Tony Joe White, that is. Terrific, rambunctious, infectious. Leavin' Anna - flows along like an instant classic, jaunty and informative with the Florida sunshine baking Malcolm's bones though all his life he'd been cold, while Way Behind amplifies the thought and effort Holcombe puts into every song: it's beautiful with a plea for help through life's struggles, common to many: "Lord have mercy now and then / when shadows follow clouds / too heavy with my tears / to hold back even now." Another Black Hole will deserve a place in 2016's 'best of' lists, as it's truly glorious in its raggedness. 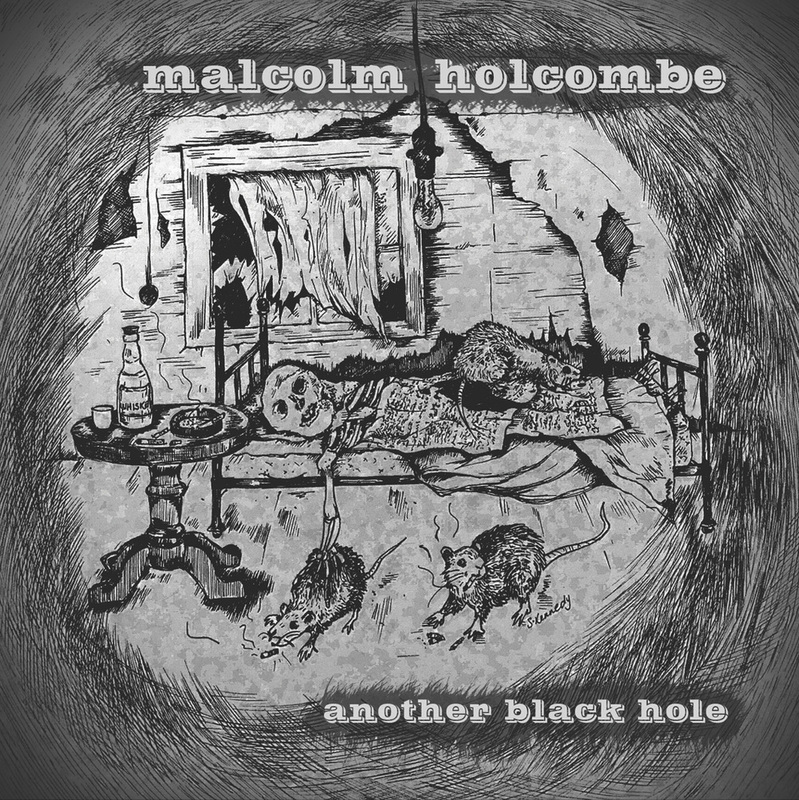 Malcolm Holcombe, "Another Black Hole" (Gypsy Eyes Music)- Malcolm Holcombe's distinctive approach to music-making has found him variously compared to everyone from Townes van Zandt to Tom Waits, and the North Carolina native's fourteenth album represents an excellent addition to the impressive body of work that this gritty performer has assembled during the past three decades. Swamp rock legend Tony Joe White chips in on guitar on a couple of tracks but Holcombe is still very much the star of the show, delivering his compellingly grizzled Americana with honesty, perception and rough-hewn charm. If you're not familiar with Holcombe, it's time to get acquainted. This package of songs is a near-faultless showcare of country-tinged roots music. Ranging from the delicate Down the River to the rattling Butcher in Town, swooning melodies, subtly varied rhythms and evocative lyrics abound. With Holcombe's grizzled voice and acoustic guitar at the core, his top-notch gang of collaborators round out every song exquisitely, though Jared Tyler's Dobro and lap steel and Tammy Rogers' fiddle deserve a special mention. The DVD is extra booty, underscoring the intensity of Holcombe's performance. A rare jewel, this should be treasured. This impressive CD / DVD package traces the highlights of Malcolm Holcombe's career to date, showcasing recently re-recorded versions of tracks from each of the ten albums that this criminally underrated country balladeer has released during the past two decades. The decision to revisit these splendid creations live in RCA's Nashville Studios gives them a freshness and spontaneity which if anything improves on the much loved originals, with "To Drink The Rain," "Mouth Harp Man" and "Who Carried You" emerging as the best of a ruggedly beautiful bunch.